THE PINK TANK: 6 tips to be a hipster. 6 tips to be a hipster. 1. Wear plaid. It's like the mod's skin head. No hipster is complete without a little plaid, get yourself to a local charity shop and stock up on a seven-day supply of plaid shirts. 2. Don't forget the beard. Obviously, we don't want to stereotype, but presume this is for the male hipsters among you. Apparently, for hipsters, the bigger the better. Gimli from Lord of the Rings must be your actual beard muse, but you claim its all about Ricky Hall! 3. Talking of Ricky Hall, he is now your number one crush and has nearly knocked Gosling out of the park. 4. Roll up, roll up. We are non-smokers here so we are completely referring to the trouser. Roll up jeans or the chino to flash a little ankle. 5. The roll up and the ankle flash brings us quite nicely to the no sock wearing rules. Prepare for smelly shoes and blisters, but socks just ruin the ankle flash vibe. 6. Don't forget the obligatory tattoos. There are no limits, sleeves for the boys, scripts or little doodle dot-to-dots for the ladies. Tats are back for hipsters. 7. Wear distressed denim. 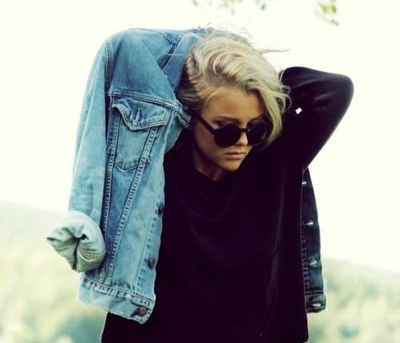 Dig out that old 80's denim jacket in a bleach wash and get your ripped jeans on. If you dare double up on denim and throw caution to the wind. Now you are set for the hipster life, go east to the Hoxton-mothership! 20 things from Friends at 20.